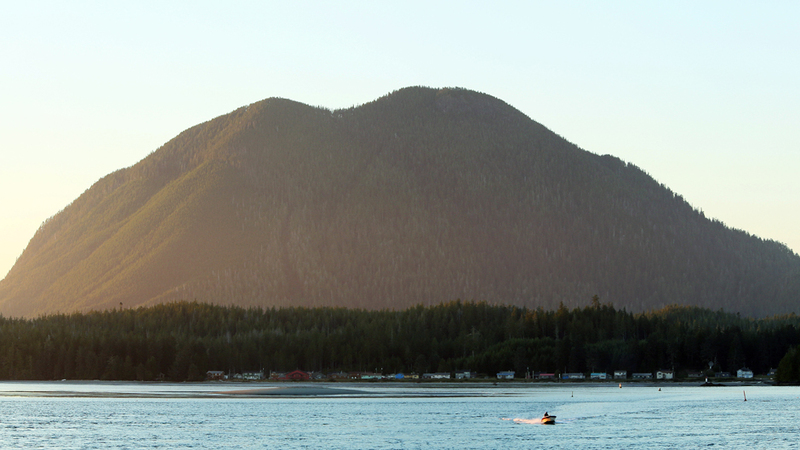 The 2,400-foot-tall Wah-nah-jus, or Lone Cone Mountain, arches above the tranquil surface of the Clayoquot Sound like the hump of a giant whale beginning a feeding dive. Photo: © Gleb Raygorodetsky. In previous chapters of this eight-part series, Adjunct Research Fellow Gleb Raygorodetsky of the United Nations University Traditional Knowledge Initiative sets about visiting the traditional territory of the Tla-o-qui-aht — widely known as Clayoquot Sound, British Columbia — to understand the challenges and triumphs their people have faced. Today we learn about the impact of industrial logging on the temperate rainforest home of the Tla-o-qui-aht, which led them to stand up, establishing Tribal Parks to protect their forests and sparking a global campaign to boycott wood and paper products made of old growth wood. On a sunny summer day, the view from Tofino’s First Street dock northward, across the Van Nevel Channel, is stunning. The 2,400-foot-tall Wah-nah-jus, or Lone Cone, arches above the tranquil surface of the Clayoquot Sound like the hump of a giant whale beginning a feeding dive. A few small skerries break through the sapphire blue glass of the Sound around the Island, like a school of porpoises frolicking alongside a whale. Red, white, and blue one-story houses, looking from a distance like bright Lego pieces, line up in a row along the water’s edge. This is the village of Opitsaht, “a gathering place” in Nuu-chah-nulth language, where for millennia Tla-o-qui-aht people would come together to spend the winter. With about 200 residents, Opitsaht is the larger of two Tla-o-qui-aht reserves. It sits on the southwestern tip of a horseshoe-shaped Meares Island and the base of the Lone Cone Mountain; the higher and more massive Mt. Colnett rises on the Island’s opposite side. The village is reachable only by water, and there is a steady trickle of fishing boats, water taxis and cruise charters of different shapes, sizes and colours streaking back and forth across the channel. 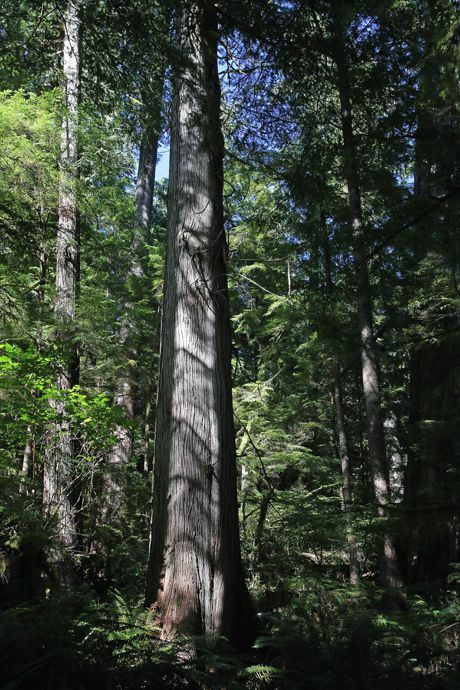 The giant trees of the coastal temperate rainforest on Meares Island are some of the Earth’s most ancient living beings, having stood witness to the region’s history, both ancient and modern, geological and ecological, natural and human. Photo: © Gleb Raygorodetsky. The vista looks like a fresh painting that is yet to dry. The air is crisp, palpably buzzing and crackling with animate energy pulsating through Clayoquot Sound. But the atmosphere here and around the sound would be a lot less vibrant and the colours much more subdued if Tla-o-qui-aht people and their allies hadn’t risen up thirty years ago to change the course of local history. It was an uprising that ultimately reverberated around British Columbia (BC), the nation of Canada and the world. When in the 1980s, BC logging giant MacMillan Bloedel was preparing to clear-cut Meares Island, the Tla-o-qui-aht people and their allies took a stand against the logging industry. They didn’t do it for themselves — after all, many of them worked as loggers — but on behalf of the Wah-nah-jus Hilth-hoo-iss, also known as Meares Island, their home. To fulfill their hereditary obligations to the future generations, or “future ancestors” as they call them, they stopped the logging on the Island and around the Clayoquot Sound to ensure that their traditional territory could continue to sustain their people for all times. It is peaceful and quiet here in the shelter of Cis-a-qis, or Heelboom Bay, the scene of the epic standoff thirty years ago. Our outboard motor is turned off, and we drift in Joe’s boat with the coming tide, along the east side of Meares Island. Not a puff of wind blows, not a single wave slaps the side of the boat. The flotation jackets we wore on the way here are now in a heap on the bottom of the boat, for the fog has finally lifted and the day is sunny and hot. A harbour seal pops its head up a few yards from the boat and peers at us inquisitively — nostrils flaring, whiskers fanning out. We prove neither threatening, nor very interesting, and the seal melts into the water as soundlessly as it appeared. We drift slowly past a cabin tucked into the dark cobalt shade of colossal trees at the water’s edge. Further up the bank, we make out a sign propped up with a few rocks, “Meares Island Tribal Park” cut deep into a weathered wooden board. Industrial forestry arrived in Clayoquot Sound with a road that opened up the region for trucks and chainsaws. By the early 1960s, vast swaths of old growth were being clear-cut. At the peak of industrial logging in the 1980s, close to one million cubic meters of old-growth, temperate rainforest vanished every year. MacMillan Bloedel chose Cis-a-qis, this small cove on the side of the Meares Island not visible from Tofino, to set up a log boom — a barrier to collect and sort floating logs to be harvested from the Island’s old growth forest. At the peak of industrial logging in the 1980s, close to one million cubic meters of old-growth, temperate rainforest vanished every year. 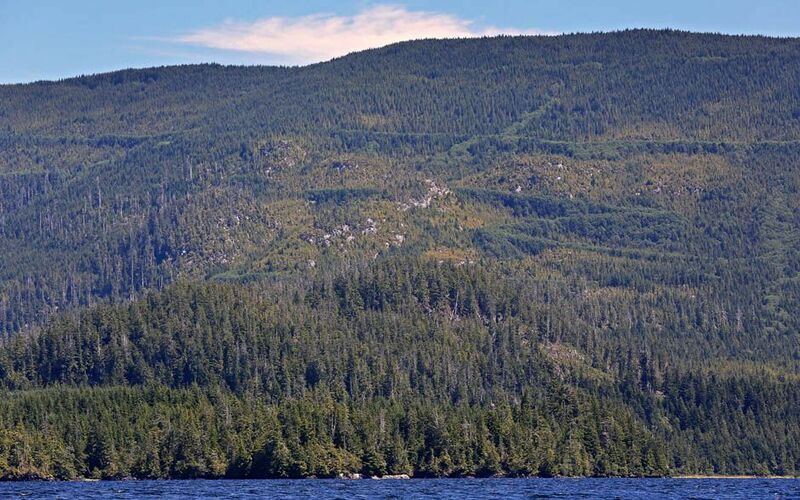 The company’s plan to keep clear-cutting of Meares Island “invisible”, however, failed. In November 1983, the Tla-o-qui-aht people learned that the BC government had approved logging of most of the 20,500 acres of Meares Island, their traditional home. On 21 April 1984, in defiance of the government’s pronouncement, the Hereditary Chiefs declared Meares Island a “Tribal Park” to ensure that their people could continue “to harvest natural unspoiled Native foods” as well as to protect all salmon streams, herring spawning grounds, trap lines, and sacred burial sites. Working with local residents and the Friends of Clayoquot Sound, a local non-profit originally set up in 1970s to protect the area from logging, the Tla-o-qui-aht people organized protests at Cis-a-qis. “My dad said, ‘Son, you don’t have to depend on anybody for anything now,’” recalls Joe Martin. “’You can make a canoe now and can go out and do whatever you like. I taught you about the forest and harvesting in the forest, and now you just go and do it.’” Photo: © Gleb Raygorodetsky. Resting his back against the outboard motor, Joe relates parts of this story as we drift. “I did work in forestry myself for twelve years before the blockade,” says Joe. “It was a well-paying job, of course, but then it was just getting too much for me. When it was raining really hard, I could see all the mud sliding into Kennedy Lake and the streams. Sometimes I’d look from the top of the slope down to the river below and see it running just brown, like the colour of a cup of hot chocolate. I knew that’s where our salmon lived. It was horrible to see…. Yeah, it really bothered me. So, I decided that I couldn’t stand it any more and quit my job! 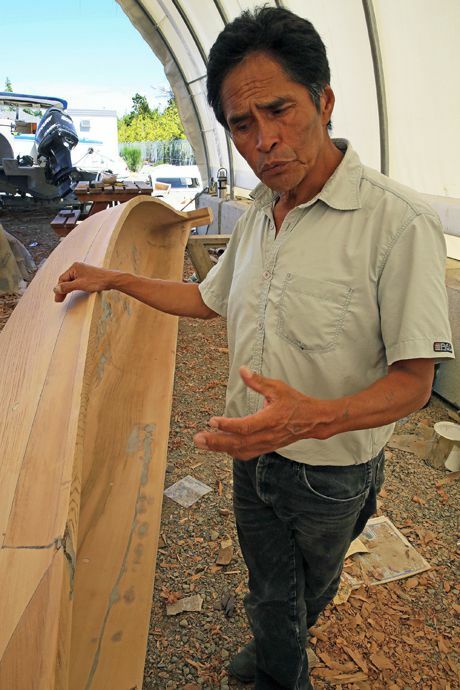 I then spent several months with my father over here at Cis-a-qis blockading and carving canoes. Some local residents working in the forestry industry became very upset with the protesters. During the blockade, people like Joe felt unsafe around Tofino — even walking down the street became hazardous, as the pro-logging residents would try to chase the protesters with their trucks. The timber company representatives demanded the picketers leave the site and let the loggers get on with their job, but when the protesters ignored their demands, the loggers had to leave themselves. Immediately, MacMillan Bloedel filed a court injunction to stop the grassroots coalition from interfering with the logging operations. The two Nuu-chah-nulth nations living on the Meares Island, the Tla-o-qui-aht and Ahousaht peoples, countered with an injunction of their own. The BC Supreme Court granted their request, outlawing logging on Meares until outstanding land claims were resolved. The Meares Island court injunction is still in effect today and the only activities allowed on the island are the upkeep of ecotourism trails, like the Big Tree Trail within the island’s Tribal Park, and the maintenance of reservoirs that supply drinking water to the municipality of Tofino across the bay — ironically, the town’s sole source of fresh water. But the struggle for the future of Clayoquot rainforest didn’t end with the court injunction and establishment of the Meares Island Tribal Park. In 1993, the BC Government announced new plans to log two thirds of the remaining old growth forest on the Sound. In response, one of the largest civil disobedience protest in the history of Canada, known as the “War in the Woods”, took place between June and November 1993. Blockades and arrests were a daily reality at the Kennedy River Bridge on the West Main logging road, where 12,000 people from around the world participated in the protests. More than 850 activists in total were arrested but later released, and all charges were eventually dropped. The standoff was accompanied by a successful well-coordinated global campaign aimed at stopping clear-cutting and banning wood and paper products made out of trees from old-growth forests. The scars of old logging roads, sometimes straight and sometimes zigzagging across the slopes, cut the mountainside into segments. Even twenty years after the last clear-cut, this green veil of brush, grasses and stunted trees cannot disguise a logged area that is yet to recover. Photo: © Gleb Raygorodetsky. The War in the Woods didn’t end logging operations in the Clayoquot completely. They continue today, but to a much lesser degree. Nevertheless, the protest was a watershed moment in environmental history. Not only has logging decreased 90 percent in the area since the early 1990s, but the government also established a Scientific Panel that developed world-class logging practices, making clear-cutting — a practice routinely favoured by industry and government — a thing of the past around the Sound. The civil disobedience strategies and tactics used during the Clayoquot protests, like a global campaign to boycott wood and paper products made of old growth wood, have been adopted by environmental campaigns as far afield as Amazonia and Indonesia. Finally, in part as a result of the focused global attention on the social and ecological riches of the area, the Clayoquot Sound was designated as an UNESCO Biosphere Reserve in 2003. Back in the boat, Joe looks out toward the Meares Island’s shore, still covered by the ancient forest, shielding his eyes from the intense afternoon sun with the palm of his hand. 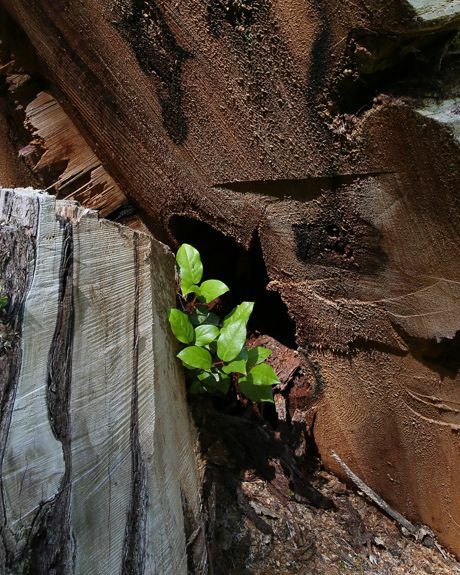 The new shoots of life burst through the scabs of clear-cuts, left by the logging industry during recent decades, are yet to heal on the mountain slopes and valleys around Clayoquot. Photo: © Gleb Raygorodetsky. “It was all worth it,” he says. “Just look at it — our garden is still here! If we didn’t stop the clear-cutting, we would’ve ended up with the same stuff like on this side,” he motions toward the mountain slopes of the Vancouver Island opposite. At first, it isn’t obvious to me what he means. The slopes he points at are covered in a green plushy coat, not the brown or gray scabs of clear-cuts. But then I notice that most of it is younger vegetation of a lighter, almost fluorescent shade of chartreuse, unlike the darker emerald hues of the old growth forest. The scars of old logging roads, sometimes straight and sometimes zigzagging across the slopes, cut the mountainside into segments. Even twenty years after the last clear-cut, this green veil of brush, grasses and stunted trees cannot disguise a logged area that is yet to recover. The natural forests were replaced with artificial stands of tree seedlings of a single species of the same age, creating plantations for future wood, chip, or pulp production. While the natural forest is filled with old, middle aged and young trees, the post-clear-cut stands are a biological desert, with both fewer species of flora and fauna and less diverse populations of both. Millennia of rainforest evolution and adaptation — a home place of the Tla-o-qui-aht people — were erased in just a few years of industrial logging. Will it also take millennia to recover? Or can it ever recover? Especially now, as the climate is changing and wild salmon, the life-sustaining source of nutrients critical for the growth of large trees in the temperate rainforest, is unlikely to ever be as abundant as before. The Tla-o-qui-aht People and Climate Change: Chapter 5 by Gleb Raygorodetsky is licensed under a Creative Commons Attribution-NonCommercial-ShareAlike 4.0 International License. Photos: © Gleb Raygorodetsky.